1951 DVD Gift Card 60th Birthday/Anniversary. This deluxe dual fold greeting card includes images and events from 1951. 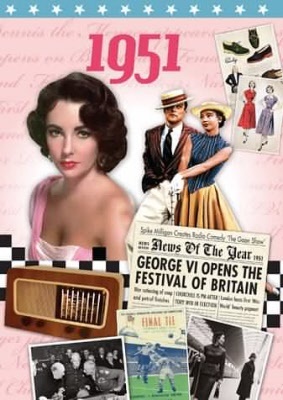 1951 DVD Gift Cardand comes complete with a full length DVD programme. See the past come to life with this card and gift in one, ideal to give anyone for whom 1951 was a special year.